"Yes, a rack of galoshes. I have been living in this house since 1903. And from then until March 1917 there was not one case — let me underline in red pencil not one case — of a single pair of galoshes disappearing from that rack even when the front door was open. There are, kindly note, twelve flats in this house and a constant stream of people coming to my consulting rooms. One fine day in March 1917 all the galoshes disappeared including two pairs of mine, three walking sticks, an overcoat and the porter's samovar. And since then the rack had ceased to exist. And I won't mention the boiler. The rule apparently is — once a social revolution takes place there's no need to stoke the boiler. But I ask you: why, when the whole business started, should everybody suddenly start clumping up and down the marble staircase in dirty galoshes and felt boots? Why must we now keep our galoshes under lock and key? And put a soldier on guard over them to prevent them from being stolen? Why has the carpet been removed from the front staircase? Did Karl Marx say anywhere that the front door of No. 2 Kalabukhov House in Prechistenka Street must be boarded up so that people have to go round and come in by the back door? What good does it do anybody? Why can't the proletarians leave their galoshes downstairs instead of dirtying the staircase?" "But the proletarians don't have any galoshes, Philip Philipovich," stammered the doctor. "Nothing of the sort!" replied Philip Philipovich in a voice of thunder, and poured himself a glass of wine. "[...] Nothing of the sort! The proletarians do have galoshes now and those galoshes are — mine! The very ones that vanished in the spring of 1917. Who removed them, you may ask? Did I remove them? Impossible. The bourgeois Sablin?" (Philip Philipovich pointed upwards to the ceiling.) "The very idea's laughable. Polozov, the sugar manufacturer?" (Philip Philipovich started to turn purple.) "Why on earth do they have to remove the flowers from the landing? Why does the electricity, which to the best of my recollection has only failed twice in the past twenty years, now go out regularly once a month? Statistics, Doctor Bormenthal, are terrible things." 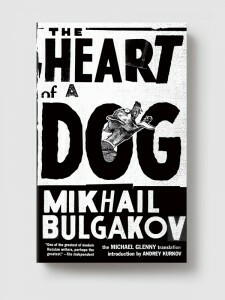 The Heart of a Dog, by Mikhail Bulgakov, is a little weird and hilarious. Philip Philipovich has brought home a stray on which to conduct a medical experiment. The doctor transplants the testes and pituitary gland of a dead man into the dog. He and his associate observe and document the dog's progress, his gradual transformation into a human. While medically speaking the experiment might be said to be a success, it doesn't go so well at all on a social level. The humanized dog is a lazy but subtly scheming drunken lecher (much as we assume the donor of his human parts must've been). Attempts to educate and cultivate him become hopeless. When the doctor risks losing more of his rooms to the proletarians invading his house, he decides there's nothing do but to turn the dog back. Translator Michael Glenny in his foreword (reprinted in the new Melville House edition with the fabulous cover art) argues that it can be read as a parable, that the doctor represents the Communist party and his operation is the revolution. "The bitter message is that the Russian intelligentsia, which made the Revolution is henceforth doomed to live with — and eventually be ruled by — the crude, unstable and potentially brutal race of hominids — homo sovieticus — which it has called into being." I rather see Philip Philipovich as wholly unsympathetic to the cause and wanting to inject a counterrevolutionary element, a better human. But Sharikov (he needs papers, after all) eschews betterment in favour of "behaving naturally," proving a kind of fatalism — that people, or dogs, are what they are, despite the accoutrements of class or, on the contrary, the attempts to annihilate it.